User Role Editor WordPress plugin Japanese translation is added with v. 2.0.3 release at April 14th, 2010. Thanks to Technolog.jp for the help. After 6 months of participation in WordPress plugins developement I still wonder how people from all over the World help each other in order to make their sweet blog platform better. Thanks to all current and future contributors! One useful note: Please not be confused with usual WordPress language translation files naming scheme name-nn_NN.po, name-nn_NN.mo, where nn_NN – language code, e.g. it_It, es_Es, etc. Such scheme is valid not for all languages. For example for Japanese we must use just a ja as the language code. So today, at April, 15, 2010 I had to rename ure-ja_JP.po and ure-ja_JP.mo files to ure-ja.po and ure-ja.mo. The source of information about WordPress specific language codes can be found here. I didn’t change plugin version and left it as 2.0.3 to not bother plugin users with plugin update requirement. If you downloaded URE 2.0.3 package yesterday, just rename Japanese language files according to the scheme above or download the latest installation package. 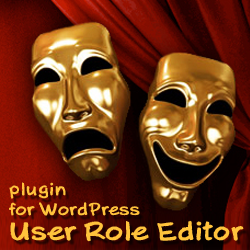 User Role Editor plugin description and download link are available at this page. This entry was posted on Wednesday, April 14th, 2010 at 09:55	and is filed under ShinePHP plugins news, WordPress. You can follow any responses to this entry through the RSS 2.0 feed. You can skip to the end and leave a response. Pinging is currently not allowed.